Chocolate candy photos can start you drooling with just a peek. In fact, delicious pictures of chocolate, desserts, and homemade candies make my mouth start to water in anticipation as soon as I set my eyes upon them. It is hard to choose my favorite pictures of chocolate candy, because I love them all for so many different reasons. 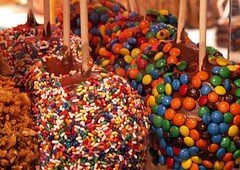 The apples pictured above are just so yummy and fun. They make me think of my childhood trips to the county fair and the laughter and games of harvest parties gone by. How about you? Do you associate pictures of chocolate or special desserts with wonderful memories and special times? I'd love to have you share your favorite photos of chocolate, candy, or desserts with us and let us join you in your walk down memory lane. 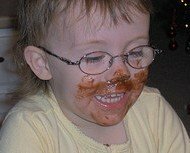 Look how this gorgeous photo shows the sheer and utter joy of childhood with chocolate smeared all over this darling face. You simply can't help but smile yourself, I bet. I know I can't - every single time I look at it. And then there are chocolate candy photos that remind me of gifts I've made or purchased to give to loved ones. 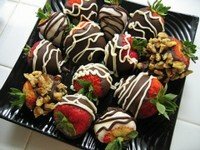 For example, look at these chocolate covered strawberries. They are complete and utter decadence, don't you think? My mom never wanted us to spoil her (especially if it cost us too much money), but she loved strawberries dipped in chocolate. So, what is YOUR favorite chocolate candy picture? It doesn't even actually have to be a picture of chocolate. Any candy, dessert, or sweet treat will do. Is it a photo you've taken of a gift you received or a recipe you made? Share your chocolate photo here along with the story behind it. Other visitors can view your contribution and make comments on your genius and clever creativity. Together we can create our own unique dessert and chocolate photo gallery as a tribute to these delightful treats and the memories we've made through them!